Get to know your council! Q & A with Barbara Pepper. Barbara Pepper (left) with her partner in crime Gale Seekins. 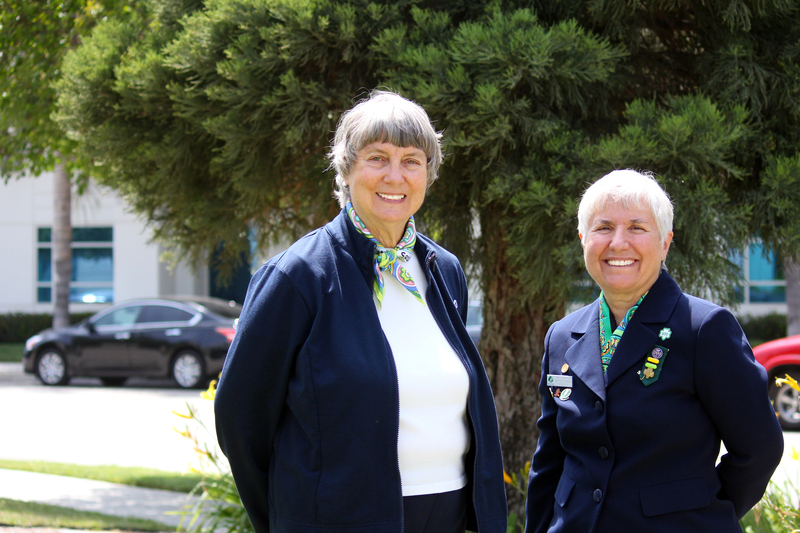 This is Barbara Pepper, she has been a Girl Scout for 27 years; 1 year as a girl member and 26 adult years as a volunteer and leader. What originally brought you to Girl Scouting? My daughter was in a troop that needed new leaders. She enjoyed it so much, I didn’t want her to have to stop Girl Scouts, and so I volunteered. I’m so glad I did. I collect California-made pottery dishes from the 1930’s thru the 1950’s. My favorites are from Vernon Kilns 1930’s. Women and girls’ right to think, work and contribute to society. They have a right to be educated. What do you hope the future will bring? I want to see girls and women take a greater role in solving the world’s problems. How many positions do you hold with our council? Troop Leader, Service Area Chair, National Delegate, Council Recognitions, Gold Award Committee, Product Sales Task Force Member, Trainer, and Archives Committee Member. Previous Previous post: Detectives at heart, have you met our Council’s keepers of history yet? Next Next post: Get to know your council! Q & A with Gail Seekins.